Let’s face it. Psychologist Abraham Maslow never wanted to be a marketer. In his work Toward a Psychology of Being he describes the 13 personality attributes of the self-actualizing person. Often depicted as the top of the pyramid on the Hierarchy of Needs, “Self-actualization” is the realization of one’s full potential, with a focus outside of self. Maslow could not have known the power of his work in shaping our approach to understanding and communicating with older adults. In our research with grandparents, the birth of the first grandchild signals the shift toward “actualization.” They describe it as a time when the future seems sharper. They feel their own mortality and grapple with the idea of the family continuing when they are gone. Relationships take on more meaning, as the sense of selflessness takes over. These attributes are so important to creating strategies that engage consumers that we are going to discuss them all – a few at a time – and specifically as they relate to the lifestage of grandparenting. 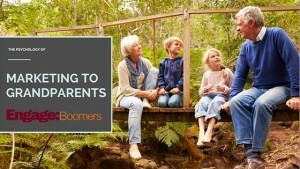 Along with caregiving and emptynesting, grandparenting represents a Boomer lifestage with the most “consumer moments” and openness to trying new products and services that they may have not considered in the past. 1. Superior perception of reality. Mature adults see things that younger consumers cannot see. Advertising claims are viewed with a much more discerning eye, and a lifetime of consumer experiences. Grandparents, in particular, are perceptive and sensitive about communications that ring false. In our research this was translated to seeing images of “real families” in terms of household makeup, ethnicity, and lifestyles. They have seen the world change during their lifetime. 2. Increased acceptance of self, others and nature. Older adults are mellower, contrary to the stereotype of the hyper-focused Boomer. They appreciate the subtle humor and ironies of daily life. For grandparents, this is reflected in a sense of greater enjoyment of their grandchildren versus their own children. They are more relaxed and present than they were as parents. Grandfathers, in particular, observe this, saying they were busy working when their children were small, so they have a “do-over” with their grandchildren. 4. Increase in problem-centering. There is a focus on problems beyond themselves; they engage in authentic problems that are beyond themselves. Grandparents report that they have an increased desire to leave the world a better place for this future generation of grandchildren. They volunteer, give to charitable causes and support organizations and principles with this mission. They may extend this focus to healing the family and putting old issues in the past for future generations. To effectively market product and services to older adults it is critical to understand psychology of older adults and to know why the things we observe in research are so. We will visit more of Maslow’s points over time. This understanding can mean the difference between talking at older adults and engaging with them in a conversation. David Wolfe, in Ageless Marketing, challenged us as marketers focused on older adults, to “tap the soul of the unchanging man.” To do that requires an understanding of archetypes, root motivations, and the powerful emotions that consumers may not even realize are lurking beneath the surface.